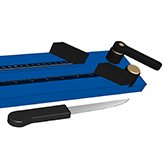 The universal packing cutter was designed for the practical cutting of packings from the roll. With the help of this cutter, packings can be cut accurately and correctly to suit the application. The measuring scale is in inches and millimetres. The scale corresponds to the shaft or spindle diameter. The packing cross-section is taken into account by adjusting the slide. The slide stop and cutting guide are designed for the optimal cut at 45°.